NASA's InSight lander will travel to Mars next year. When it does, it will be carrying two microchips bearing the names of members of the public. Nasa lanceert op 5 mei 2018 Insights Lander met de Atlas 401 raket vanaf Vanderberg AFB en zal arriveren op 26 november 2018 op de Elysium Planitia op Mars. Wat is de daadwerkelijke missie? Insight heeft aan boord instrumenten zoals seismografen die Marsbevingen gaat registreren, maar ook de inslagen van meteorieten. Tevens hebben ze een nieuw instrument die dieper in de grond kan boren dan zijn voorgangers. Op zich natuurlijk al zeer interessant, maar wat het nog net even wat leuker maakt, is dat Nasa het publiek de kans geeft mee te participeren. Als je bij hen je naam en emailadres opgeeft en land van herkomst, ontvang je een boarding pass. Jouw naam zal dan op een chip gezet worden - samen met alle anderen die dit ook hebben gedaan - en meegaan naar Mars. Inschrijven kon tot 1 november, dus ik was al enigszins aan het balen. Desondanks keek ik toch nog of het mogelijk was én het is me dus zojuist alsnog gelukt om een boardingpass te ontvangen! Met deze pas, kan je bijhouden, hoeveel kilometers er al zijn afgelegd en blijf je van de hele missie up to date gehouden. Ik volg lanceringen altijd al met veel interesse, maar geloof maar dat ik op 5 mei 2018 op het puntje van mijn stoel zal zitten. "Mars continues to excite space enthusiasts of all ages," said Bruce Banerdt, the InSight mission's principal investigator at NASA's Jet Propulsion Laboratory in Pasadena, California. "This opportunity lets them become a part of the spacecraft that will study the inside of the Red Planet." This fly-your-name opportunity comes with "frequent flier" points reflecting an individual's personal participation in NASA's exploration of Mars. These points span multiple missions and multiple decades. Participants who sent their names on the previous InSight opportunity in 2015 can download a "boarding pass" and see their "frequent flier" miles. As part of this frequent flier program, a chip carrying the names of 1.38 million people also flew aboard the first flight of NASA's Orion spacecraft in 2014. NASA is building Orion to carry astronauts to deep space destinations that will enable future missions to Mars. After InSight, the next opportunity to earn frequent flier points will be NASA's Exploration Mission-1, the first flight bringing together the Space Launch System rocket and Orion spacecraft to travel thousands of miles beyond the Moon in preparation for human missions to Mars and beyond. InSight will be the first mission to explore Mars' deep interior. The spacecraft will set down a seismometer to detect marsquakes and meteor strikes, using the seismic energy of these phenomena to study material far below the Martian surface. It also will deploy a self-hammering heat probe that will burrow deeper into the ground than any previous device on the Red Planet. These and other InSight investigations will improve our understanding about the formation and evolution of all rocky planets, including Earth. NASA has set a new launch opportunity, beginning May 5, 2018, for the InSight mission to Mars. InSight is the first mission dedicated to investigating the deep interior of Mars. The findings will advance understanding of how all rocky planets, including Earth, formed and evolved. 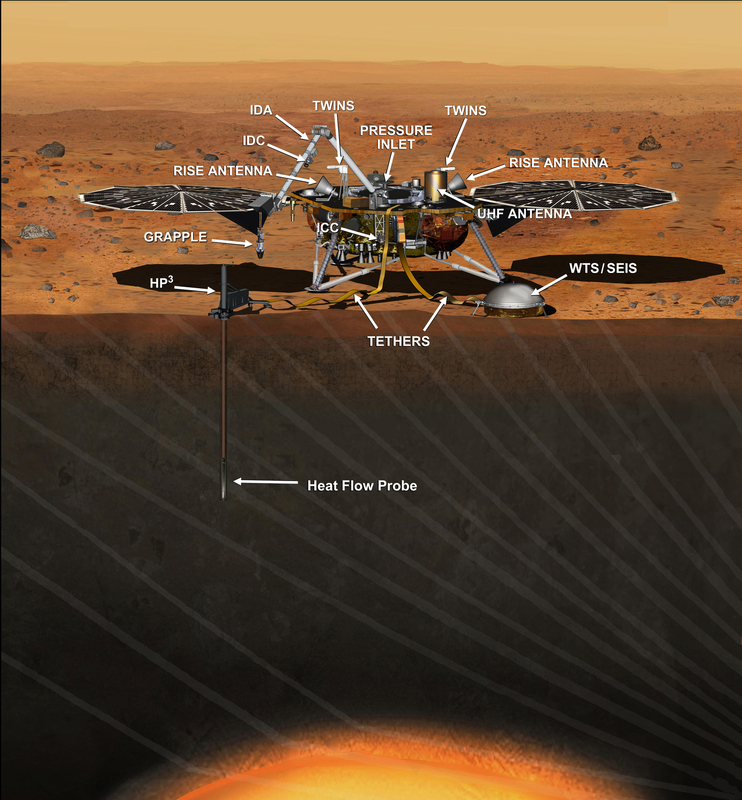 This artist's concept depicts the InSight lander on Mars after the lander's robotic arm has deployed a seismometer and a heat probe directly onto the ground. NASA is moving forward with a spring 2018 launch of its InSight mission to study the deep interior of Mars, following final approval this week by the agency’s Science Mission Directorate. The Interior Exploration using Seismic Investigations, Geodesy and Heat Transport (InSight) mission was originally scheduled to launch in March of this year, but NASA suspended launch preparations in December due to a vacuum leak in its prime science instrument, the Seismic Experiment for Interior Structure (SEIS). The new launch period for the mission begins May 5, 2018, with a Mars landing scheduled for Nov. 26, 2018. The next launch opportunity is driven by orbital dynamics, so 2018 is the soonest the lander can be on its way. The SEIS instrument -- designed to measure ground movements as small as half the radius of a hydrogen atom -- requires a perfect vacuum seal around its three main sensors in order to withstand harsh conditions on the Red Planet. Under what’s known as the mission “replan,” NASA’s Jet Propulsion Laboratory in Pasadena, California, will be responsible for redesigning, developing and qualifying the instrument's evacuated container and the electrical feedthroughs that failed previously. France's space agency, the Centre National d'Études Spatiales (CNES), will focus on developing and delivering the key sensors for SEIS, integration of the sensors into the container, and the final integration of the instrument onto the spacecraft. The German Aerospace Center (DLR) is contributing the Heat Flow and Physical Properties Package (HP3) to InSight’s science payload. NASA’s budget for InSight was $675 million. The instrument redesign and two-year delay add $153.8 million. The additional cost will not delay or cancel any current missions, though there may be fewer opportunities for new missions in future years, from fiscal years 2017-2020. CNES President Jean-Yves Le Gall added, "This confirmation of the launch plan for InSight is excellent news and an unparalleled opportunity to learn more about the internal structure of the Red Planet, which is currently of major interest to the international science community." The InSight Project is managed by JPL for NASA's Science Mission Directorate, Washington. Lockheed Martin Space Systems, Denver, built the spacecraft. InSight is part of NASA's Discovery Program, which is managed by NASA's Marshall Space Flight Center in Huntsville, Alabama. Deze missie stond eigenlijk gepland voor 2016, echter de NASA heeft deze toen uit moeten stellen. Derhalve zijn de eerste foto's ook uit 2015. The process of selecting a site for NASA's next landing on Mars, planned for September 2016, has narrowed to four semifinalist sites located close together in the Elysium Planitia region of Mars. The mission known by the acronym InSight will study the Red Planet's interior, rather than surface features, to advance understanding of the processes that formed and shaped the rocky planets of the inner solar system, including Earth. 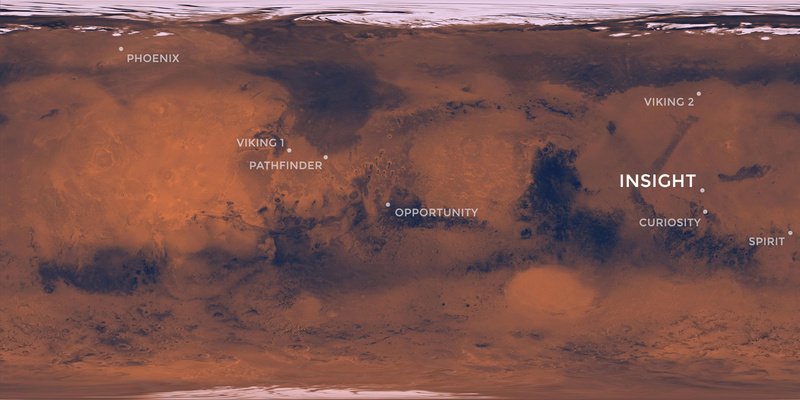 The location of the cluster of semifinalist landing sites for InSight is indicated on this near-global topographic map of Mars, which also indicates landing sites of current and past NASA missions to the surface of Mars. The mission's full name is Interior Exploration Using Seismic Investigations, Geodesy and Heat Transport. The location of Elysium Planitia close to the Martian equator meets an engineering requirement for the stationary InSight lander to receive adequate solar irradiation year-round on its photovoltaic array. The location also meets an engineering constraint for low elevation, optimizing the amount of atmosphere the spacecraft can use for deceleration during its descent to the surface. The number of candidate landing sites for InSight was trimmed from 22 down to four in August 2013. This down-selection facilitates focusing the efforts to further evaluate the four sites. Cameras on NASA's Mars Reconnaissance Orbiter will be used to gather more information about them before the final selection. The topographic map uses data from the Mars Orbiter Laser Altimeter on NASA's Mars Global Surveyor spacecraft. The color coding on this map indicates elevation relative to a reference datum, since Mars has no "sea level." The lowest elevations are presented as dark blue; the highest as white. The difference between green and orange in the color coding is about 2.5 miles (4 kilometers) vertically. InSight will deploy a heat-flow probe designed to hammer itself 3 to 5 yards (or meters) deep and monitor heat coming from the planet's interior. The mission will also use a seismometer and radio science. The French space agency Centre National d'Etudes Spatiales, or CNES, and the German Aerospace Center, or DLR, are contributing instruments to the mission. Lockheed Martin Space Systems, Denver, is building the spacecraft. InSight is part of NASA's Discovery Program of competitively selected solar system exploration missions with highly focused scientific goals. NASA's Marshall Space Flight Center in Huntsville, Ala., manages the Discovery Program for the agency's Science Mission Directorate in Washington. NASA's Jet Propulsion Laboratory, a division of the California Institute of Technology, Pasadena, manages InSight for the NASA Science Mission Directorate. For more information about InSight, visit: http://insight.jpl.nasa.gov . The Mars lander that NASA's InSight mission will use for investigating how rocky planets formed and evolved is being assembled by Lockheed Martin Space Systems, Denver. In this scene from January 2015, Lockheed Martin spacecraft specialists are working on the lander in a clean room. InSight, for Interior Exploration Using Seismic Investigations, Geodesy and Heat Transport, is scheduled for launch in March 2016 and landing in September 2016. At center is the cruise stage, which will serve multiple functions during the flight from Earth to Mars. In the background is the InSight lander. InSight, for Interior Exploration Using Seismic Investigations, Geodesy and Heat Transport, will investigate the deep interior of Mars to gain information about how rocky planets, including Earth, formed and evolved. The mission is scheduled for launch from California in March 2016 and landing on Mars in September 2016. The wind tunnel is 80 feet (24 meters) tall and 120 feet (37 meters) wide. It is part of the National Full-Scale Aerodynamics Complex, operated by the Arnold Engineering Development Center of the U.S. Air Force. InSight, for Interior Exploration Using Seismic Investigations, Geodesy and Heat Transport, is scheduled to launch in March 2016 and land on Mars in September 2016. The lander will investigate the deep interior of Mars to gain information about how rocky planets, including Earth, formed and evolved. Lockheed Martin Space Systems, Denver, is building the InSight spacecraft. The InSight Project is managed by NASA's Jet Propulsion Laboratory, Pasadena, California, for the NASA Science Mission Directorate, Washington. InSight is part of NASA's Discovery Program, which is managed by NASA's Marshall Space Flight Center in Huntsville, Alabama. In this photo, the back shell of NASA's InSight spacecraft is being lowered onto the mission's lander, which is folded into its stowed configuration. The back shell and a heat shield form the aeroshell, which will protect the lander as the spacecraft plunges into the upper atmosphere of Mars. The photo was taken on April 29, 2015, in a spacecraft assembly clean room at Lockheed Martin Space Systems, Denver. Spacecraft specialists at Lockheed Martin Space Systems, Denver, are preparing to attach the cruise stage of NASA's InSight spacecraft to the top of the spacecraft's back shell in this April 29, 2015, photo. The cruise stage will serve multiple functions during the flight from Earth to Mars. It has its own solar arrays, thrusters and radio antennas. It will be jettisoned shortly before the spacecraft enters the Martian atmosphere. In this photo, spacecraft specialists at Lockheed Martin Space Systems, Denver, are reaching up to guide lowering of the parachute cone for installation onto NASA's InSight spacecraft. The photo was taken on April 29, 2015. InSight's parachute, stowed inside the cone, will provide deceleration in the Martian atmosphere. Its role will come after atmospheric friction with the spacecraft's heat shield provides initial deceleration and before thrusters on the lander provide final deceleration. The science deck of NASA's InSight lander is being turned over in this April 29, 2015, photo from InSight assembly and testing operations inside a clean room at Lockheed Martin Space Systems, Denver. The large circular component on the deck is the protective covering to be placed over InSight's seismometer after the seismometer is placed directly onto the Martian ground. The dime-size microchip in this close-up image carries 826,923 names that will go to Mars on NASA's InSight lander. The image was taken in November 2015 inside a clean room at Lockheed Martin Space Systems, Denver, where the lander was built. InSight, for Interior Exploration using Seismic Investigations, Geodesy and Heat Transport, will launch from Vandenberg Air Force Base, California, in March 2016 and land on Mars on Sept. 28, 2016. This is the first Mars mission dedicated to study the deep interior of Mars. Its findings will advance understanding of the early history of all rocky planets, including Earth. The chip is affixed to the InSight lander deck and will remain on Mars forever. 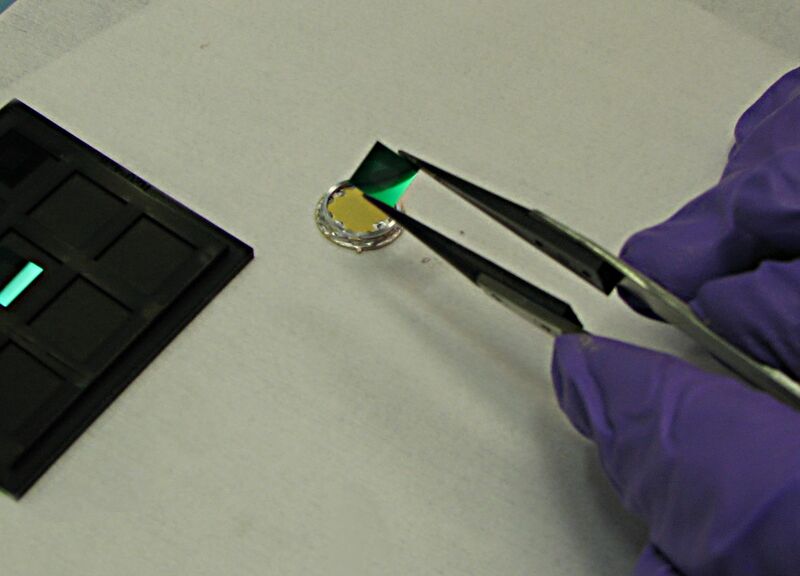 Engineers at NASA's Jet Propulsion Laboratory, Pasadena, California, etched the names onto a silicon wafer or microchip. They used an electron beam machine at JPL that specializes in etching very tiny features (less than 1 micron, or less than one one-thousandth the width of a human hair). They use this machine to make high-precision microdevices in JPL's Microdevices Laboratory. This technique was also used to write millions of names that were transported on Mars rovers and Orion's first test flight. The InSight Project is managed by JPL, a division of the California Institute of Technology in Pasadena, for the NASA Science Mission Directorate, Washington. InSight is part of NASA's Discovery Program, which is managed by NASA's Marshall Space Flight Center in Huntsville, Alabama. A crate containing NASA's Mars-bound InSight spacecraft is loaded into a C-17 cargo aircraft at Buckley Air Force Base, Denver, for shipment to Vandenberg Air Force Base, California. The spacecraft, built by Lockheed Martin Space Systems, was shipped Dec. 16, 2015, for launch in March 2016. Members of the InSight mission's assembly, test and launch operations (ATLO) team remove the “birdcage” from NASA's InSight spacecraft, in this photo taken June 19, 2017, in a Lockheed Martin clean room facility in Littleton, Colorado. The birdcage is the inner layer of protective housing that shielded the spacecraft while in storage following a postponement of launch. It is made of a film that dissipates electrostatic conditions to protect the spacecraft from contamination. The InSight mission (for Interior Exploration using Seismic Investigations, Geodesy and Heat Transport) is scheduled to launch in May 2018 and land on Mars Nov. 26, 2018. It will investigate processes that formed and shaped Mars and will help scientists better understand the evolution of our inner solar system's rocky planets, including Earth. InSight is part of NASA's Discovery Program of competitively selected solar system exploration missions with highly focused scientific goals. NASA's Marshall Space Flight Center in Huntsville, Alabama, manages the Discovery Program for the agency's Science Mission Directorate in Washington. NASA's Jet Propulsion Laboratory, a division of the Caltech in Pasadena, California, manages InSight for the NASA Science Mission Directorate. Lockheed Martin Space Systems, Denver, built the spacecraft. The Mars lander portion of NASA's InSight spacecraft is lifted from the base of a storage container in preparation for testing, in this photo taken June 20, 2017, in a Lockheed Martin clean room facility in Littleton, Colorado. Lockheed Martin spacecraft specialists check the cruise stage of NASA's InSight spacecraft in this photo taken June 22, 2017, in a Lockheed Martin clean room facility in Littleton, Colorado. The cruise stage will provide vital functions during the flight from Earth to Mars, and then will be jettisoned before the InSight lander, enclosed in its aeroshell, enters Mars' atmosphere. The Seismic Experiment for Interior Structure (SEIS) instrument for NASA's InSight mission to Mars undergoes a checkout for the spacecraft's assembly, test and launch operations (ATLO) in this photo taken July 20, 2017, in a Lockheed Martin clean room facility in Littleton, Colorado. The SEIS was provided by France's national space agency (CNES) with collaboration from the United States, the United Kingdom, Switzerland and Germany. This view looks upward toward the InSight Mars lander suspended upside down. It shows the top of the lander's science deck with the mission's two main science instruments -- the Seismic Experiment for Interior Structure (SEIS) and the Heat Flow and Physical Properties Probe (HP3) -- plus the robotic arm and other subsystems installed. The photo was taken Aug. 9, 2017, in a Lockheed Martin clean room facility in Littleton, Colorado. Edit Joyce: Ik ook! zitten jullie naast elkaar? Vandaag is het zover! Ik ga naar Mars, dat wil zeggen mijn naam . De lancering is om 11:05 uur Nederlandse tijd. NASA heeft zaterdagmiddag twee nieuwe missies naar Mars gelanceerd. Zowel de Mars InSight als de MarCO is aan boord van een Atlas V-raket van ruimtevaartbedrijf United Launch Alliance richting de 'rode planeet' gestuurd.InSight is een lander die op Mars bodemonderzoek doen, MarCO bestaat uit twee communicatiesatellieten. Om 13.05 uur Nederlandse tijd werd de Atlas V gelanceerd vanuit de Vandenberg Air Force Base in Californië. De lancering verliep succesvol. De weersomstandigheden waren goed en alles verliep volgens het plan van NASA. Daarmee is deze lancering de eerste die vanaf de Amerikaanse westkust plaatsvindt. InSight en MarCO hebben elk eigen doelen, maar staan wel met elkaar in verband. De InSight-Marslander gaat met behulp van drie instrumenten de opbouw van de planeet bestuderen. De raket komt zes maanden na lancering aan op Mars, waarna de lander ongeveer tien weken nodig heeft om zijn apparatuur op te zetten. Zodra de apparatuur staat, zal het in eerste instantie twee jaar lang metingen doen. De data van deze metingen worden direct naar de aarde verzonden, maar ook naar de experimentele MarCO-satellieten. Deze satellieten sturen zelf ook data naar de aarde door. NASA test hiermee de mogelijkheden om satellieten in een baan om een andere planeet dan de aarde te sturen. InSight moet de grondigste meting van de opbouw van Mars ooit worden. Met de onderzoeksresultaten zegt NASA niet alleen meer over de planeet te kunnen leren, maar ook over de vorming van andere planeten met een rotsoppervlak. De lander is uitgerust met een seismograaf, een thermometer en een zender. De seismograaf gaat trillingen in de grond van de 'rode planeet' registreren. De HP3-thermometer boort zich 5 meter diep in de grond van Mars, dieper dan tot nu toe is gedaan door een Marslander. De RISE-zender laat precies weten waar de InSight, en dus de hele planeet, zich in de melkweg bevindt. Zo kunnen afwijkingen worden geregistreerd, zoals schommelingen in de baan die Mars om de zon draait. De MarCO-A en MarCO-B zijn elk niet groter dan 40 centimeter en zijn gebouwd volgens het CubeSat-model. CubeSats zijn kleine satellieten waarvan al honderden in een baan om de aarde zijn geschoten. Door hun formaat kunnen ze worden gelanceerd via overgebleven laadruimte in grotere ruimtevaartuigen. Sorry, maar wil alles goed kunnen zien he. Krijg jij mijn zakje pinda's/snackje wel onderweg. MarCo maakt eerste foto van de aarde als test. Afstand 1 miljoen km. Nog 6.970.260 km, 6.970.259 km etc te gaan. Nog 27 dagen, 8 uur en 42 minuten te gaan tot de landing van Insight. Hij is momenteel 68.570.820 (op moment van typen...en nu alweer zoveel km verder ) van de aarde verwijderd en 6.968.030 km (...en nu weer dichterbij , hij vliegt snel) van Mars af. Op 26 november is dan de dag dat we (de geïnteresseerden onder ons) rechtop op onze stoel gaan zitten om de landing te volgen. Insight zal landen op de Elysium Planitia (zie afbeelding). Daarbij zullen ook de namen van 2429807 mensen die op een microchip zijn gezet voor altijd op Mars verblijven. Vandaag is het zover, Insight gaat op Mars landen! Op 5 mei 2018 werd Insight gelanceerd met de Atlas 401 raket van AFB Vandenberg. Vervolgens werd er ruim 55 miljoen kilometer afgelegd om bij onze buurplaneet te arriveren. En vanavond (circa 21:00 uur Nederlandse tijd) is het dan zover. Insight gaat landen op Mars op het Elysium Planitia. Insight zal met een snelheid van ruim 20.000 km/u de Marsatmosfeer binnendringen in een hoek van 12 graden. Het hitteschild krijgt temperaturen te verduren van wel 1000 graden Celcius (meer info zie artikel hieronder, of de eerdere berichten over Insight op deze pagina). Insight heeft seismografen aan boord die dieper gaan dan hun voorgangers om zowel Marsbevingen te registreren alsook de impact van meteorietinslagen. Daarbij zijn ook de namen van 2.429.807 mensen op een chip gezet. Deze chip is aan boord van Insight. Deze mensen (ja ik ook!) zullen allemaal een beetje Marsmannetjes en Marsvrouwtjes worden . NASA's InSight-missie landt op Mars, maar hoe werkt dat? De InSight van ruimtevaartorganisatie NASA zal maandag aankomen op Mars, nadat die op 5 mei dit jaar werd gelanceerd. De InSight bestaat uit een Marslander met meerdere meetinstrumenten die grondonderzoek zullen uitvoeren op de 'Rode Planeet', mits de landing slaagt. Maar hoe land je een ruimtevoertuig op ruim 55.7 miljoen kilometer van de aarde? Van alle landingen op Mars tot nu toe, is 40 procent gelukt. Bijvoorbeeld alle Europese pogingen zijn mislukt. De landingen zijn risicovol, omdat ze uit veel verschillende stappen bestaan en elke stap perfect moet verlopen. Sinds de lancering in mei, vliegt de InSight richting Mars via de zogenoemde Cruise Stage. De lander zelf zit verpakt in een hittebestendig schild en een huls. Dit schild moet InSight beschermen tegen de ruim 1.000 graden Celsius waar het ruimtevoertuig tijdens de val door de atmosfeer mee te maken krijgt. De Cruise Stage is een systeem dat aan de huls van de lander vastzit en wordt aangedreven door zonnepanelen. Het systeem verzorgt onder meer de communicatie met de aarde en de navigatie naar de doelplaneet. Zodra de InSight dicht genoeg bij Mars is, koppelt de Cruise Stage los en gaat de huls met de InSight richting de oppervlakte. De volgende stap is het binnengaan van de atmosfeer. De lander beweegt met een snelheid van bijna 21.000 kilometer per uur en moet de atmosfeer doorkruisen met een hoek van 12 graden. Als de hoek scherper is, doorkruist de lander de atmosfeer niet en gaat die terug de ruimte in. Als de hoek stomper is, verbrandt de lander in de atmosfeer. Zodra het ruimtevoertuig de atmosfeer betreedt, moet het nog ruim 128 kilometer vallen tot het op de oppervlakte komt. De InSight moet in minder dan twee minuten afremmen van ongeveer 20.000 kilometer per uur naar ongeveer 1.600 kilometer per uur. Op ongeveer 16 kilometer hoogte boven het oppervlak, activeert de parachute. Vijftien seconden nadat de parachute uitklapt, wordt het hitteschild door middel van zes kleine explosies van het ruimtevoertuig afgeblazen. Tien seconden na het wegblazen van het hitteschild, klapt het landingsgestel van de lander uit. Op ruim 1,5 kilometer hoogte laat de lander los van de huls en de parachute en valt deze op eigen kracht naar Mars. De motoren van de lander gaan aan en het ruimtevoertuig moet uit de buurt van de huls met parachute bewegen, om niet geraakt te worden. Ten slotte moeten de motoren direct uit als de InSight de oppervlakte van Mars raakt. Als de motoren te laat uitgaan, valt het toestel om. InSight zal landen op een vlakte met de naam Elysium Planitia, een gebied waar onderzoekers verwachten geen rotsen of heuvels aan te treffen. Dit is belangrijk, omdat er dan geen obstakels zijn die de landing van de InSight kunnen dwarsbomen. NASA noemt Elysium Planitia ook wel de "grootste parkeerplaats van Mars". Ook ligt Elysium Planitia dicht bij de evenaar, zodat er te allen tijde genoeg zonlicht is om de InSight van stroom te voorzien. Onderzoekers kijken verder naar de afstand van het oppervlak tot de atmosfeer, om ervoor te zorgen dat InSight genoeg ruimte heeft om vaart te minderen en veilig te landen. Ten slotte bestaat de grond van Elysium Planitia niet uit massief rots, zodat de warmtesensor van de InSight zich makkelijk in de bodem kan boren. Zodra de InSight veilig is geland, zal die zijn eigen instrumenten opstellen voor onderzoek. Eerst klapt de InSight zijn zonnepanelen uit en gaat een camera aan die panoramabeelden van de vlakte van Elysium Planitia maakt. Vervolgens wordt een grijparm geactiveerd die de apparatuur van InSight op de grond neerzet. Eerst wordt een seismograaf neergezet, die bevingen in de grond detecteert. Hier plaatst de arm vervolgens een wind- en temperatuurschild overheen, om te voorkomen dat de metingen van het apparaat worden verstoord. Tenslotte zet de InSight een warmtesonde neer, die zich in vier tot zes weken tijd 5 meter diep in de grond boort. Deze sonde zal meten hoe hitte wordt uitgestoten vanaf de kern van Mars. De InSight beschikt ook over apparatuur die niet opgesteld hoeft te worden, zoals een meter die bekijkt hoe Mars 'wiebelt' in zijn baan om de zon. Dit kan ook informatie geven over de opbouw van de planeet. De Insight werd samen met twee kleine satellieten gelanceerd. De MarCO-A en MarCO-B zijn niet groter dan 40 centimeter. MarCO-A en MarCO-B worden ook wel 'Wall-E' en 'EVE' genoemd, naar de twee hoofdpersonages uit de Pixar-animatiefilm Wall-E.
Dit omdat de satellieten zich voortduwen met een gas dat ook wordt gebruikt in brandblussers. In de film gebruikt de robot Wall-E een brandblusser om zich in de ruimte voort te duwen. De data van de metingen worden direct naar de aarde verzonden, maar ook via de experimentele MarCO-satellieten. NASA test hiermee de mogelijkheden om satellieten in een baan om andere planeten dan de aarde te sturen. 11:47 a.m. PST (2:47 p.m. EST) — Atmospheric entry at about 12,300 mph (19,800 kph), beginning the entry, descent and landing phase (binnenkomst van de Marsatmosfeer met een snelheid van 19.800 km/u, de daling en de landingdfase). 20 seconds later — Separation from the back shell and parachute (loskoppelen omhulsel en parachute). 0.5 second later — The retrorockets, or descent engines, begin firing (ontsteken van de landingsraketten). 2.5 seconds later — Start of the "gravity turn" to get the lander into the proper orientation for landing (start zwaartekracht -draai, voor de goede oriëntatie voor de landing). 22 seconds later — InSight begins slowing to a constant velocity (from 17 mph to a constant 5 mph, or from 27 kph to 8 kph) for its soft landing (InSight neemt langzaam een constante snelheid aan voor een zachte landing. Van 27 km/u tot 8 km/u). 11:54 a.m. PST (2:54 p.m. EST) — Expected touchdown on the surface of Mars (verwachtte landingstijd op Mars). 12:01 p.m. PST (3:01 p.m. EST) — "Beep" from InSight's X-band radio directly back to Earth, indicating InSight is alive and functioning on the surface of Mars (Het eerste radiosignaal, dat Insight veilig geland en operatief is). 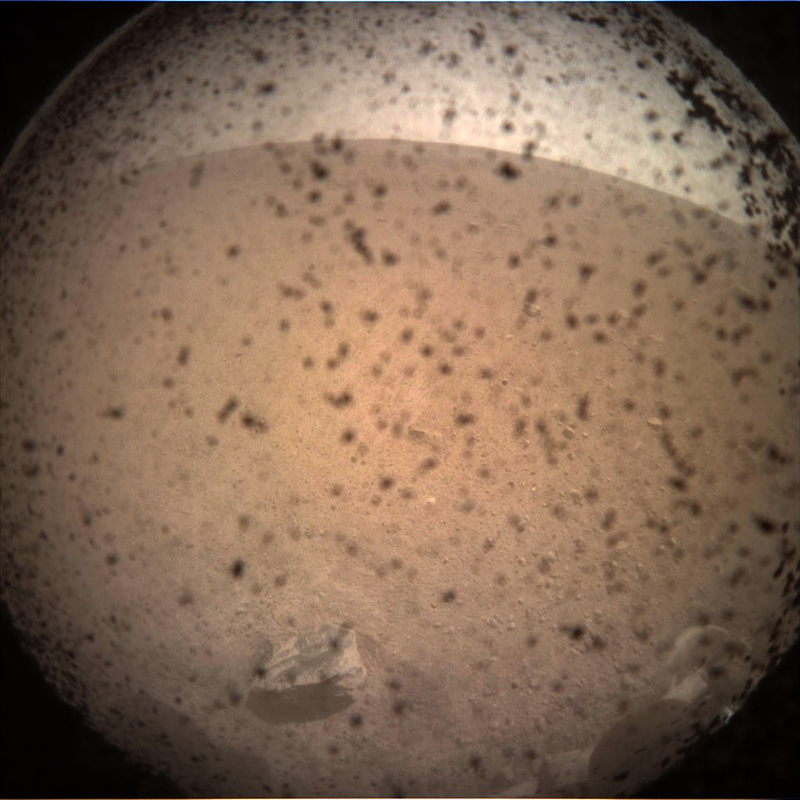 No earlier than 12:04 p.m. PST (3:04 p.m. EST), but possibly the next day — First image from InSight on the surface of Mars (tijdstip van de eerste foto, gemaakt door Insight, maar komt waarschijnlijk morgen). No earlier than 5:35 p.m. PST (8:35 p.m. EST) — Confirmation from InSight via NASA's Mars Odyssey orbiter that InSight's solar arrays have deployed (bevestiging van Insight, via NASA's Mars Odyssey orbiter, dat de zonnepanelen zijn uitgeklapt). InSight voert een perfecte landing uit! Een goede morgen allemaal. Het was gisteren een spannende avond, zowel voor de Nasa als voor mij. We waren door radio 2 benaderd om live een interview te doen - tijdens de landing van Insight - bij het radioprogramma "De staat van Stasse". Reuze spannend en een bijzondere ervaring. Ik had daarna echter nog zoveel adrenaline in mijn lijf, dat ik nu pas met de update hier kom..sorry daarvoor . 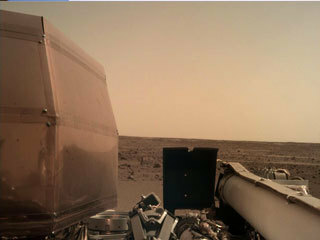 InSight landde om 20:54 uur op Mars. Nasa noemde de laatste minuten "seven minutes of terror", maar werkelijk alles ging volgens het boekje. Een paar minuten na de landing stuurde InSight al zijn eerste foto door. Hierop was nog niet veel te zien, doordat er stofdeeltjes op de lens waren gekomen. Het zal nu nog circa 2 - 3 maanden duren, voordat InSight helemaal operationeel is. We houden de ontwikkelingen in de gaten en zullen hier de updates plaatsen. Insight's zonnepanelen zijn uitgeklapt en functioneren. Insight heeft signalen afgegeven, dat de zonnepanelen zijn uitgeklapt en het zonlicht opvangen. Dit was een belangrijke stap in de missie, want indien de batterijen niet opgeladen worden..heb je ook geen missie. De panelen zijn elk 2,2 meter breed als ze geopend zijn. Insight - met geopende panelen - is ongeveer net zo groot als een Cabrio uit de jaren '60. Op een zonnige dag leveren ze 600-700 watt op (bij ons thuis net genoeg om een blender op te laten lopen), maar als er stof op de panelen komt te liggen - wat geregeld voor zal komen - dan leveren de panelen op zijn minst 200- 300 watt op. De panelen zijn van dezelfde soort als de panelen die bij de Phoenix lander zijn gebruikt, alleen zijn ze iets groter. Dit om meer vermogen te krijgen voor de instrumenten aan boord van Insight en hun missie én Insight moet 1 Marsjaar blijven functioneren (dat komt overeen met 2 jaar op aarde). In de komende dagen zal de robotarm worden uitgeklapt en zullen er foto's worden gemaakt om te kijken waar de apparatuur op het Marsoppervlak geplaatst zullen gaan worden. Het zal 2 - 3 maanden duren voordat deze operationeel zijn en wij de eerste data ervan zullen ontvangen. Zo hee we zijn er hoor wat een uitzicht toch ook, alleen wel erg stil hoor. Citaat van wappy, woensdag 28 november 2018, 14:57 uur Zo hee we zijn er hoor wat een uitzicht toch ook, alleen wel erg stil hoor. ja ik was even sprakeloos van het uitzicht, maar pak een bakje leut en een koekje erbij en dan gaan we eens gezellig aan de babbel. heb je nog pinda's over van de reis? Er zijn nu 448 mensen aan het browsen op het forum. 2 Daarvan zijn ingelogd. Van die 448, lezen 4 mensen het topic "Lente discussietopic 2019".